3. EW is the son of EW, Jr.
4. EW, Jr. is the son of EW, Sr.
5. EW, Sr. is the son of Samuel W.
6. Samuel W. is the son of Samuel W.
This trail tells us that Samuel is the fourth great grandfather of CW. Which places this Brickwall squarely in the range where we can use Autosomal tests to help determine the possible siblings and cousins of Samuel. But to find his father we will need to look at CW’s y-DNA test information. 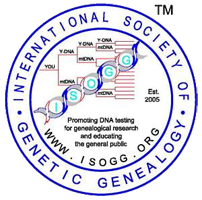 We know that he is haplogroup (“A haplogroup is a genetic population group of people who share a common ancestor on the patrilineal or matrilineal line – ISOGG ) R1b1b2 (from 23andMe) or R-M269 (FamilyTree DNA) which is a very common Western European haplogroup. Since we know his haplogroup we can look to see if there is a “W” DNA project by doing a google search. To our surprise, we not only find a “W” DNA Project but CW has already joined this project. Scrolling down the Project Results spreadsheet, we find CW in the list of Project Kits. We see also, adjacent to CW, others who are listed in the same Haplogroup with very close connections to CW and his brickwall. They are, Levi, b. 1780 and William, b. abt. 1800. How do we know they are close? It’s in the numbers – they are grouped together in the DNA Project spreadsheet because they share mutations (“A permanent structural alteration or change in the DNA sequence. Mutations in the sperm or egg are called germline mutations. Germline mutations in the Y chromosome of the male are passed on to all of his male-line descendants. Mutations that occur after conception are called somatic mutations; these mutations may be found in different tissues of the body and they are not passed on to offspring” – ISOGG). CW has information that shows his brickwall Samuel was most probably born and lived in Maine. His birthplace is listed as Cornish Maine in his son’s Death Certificate. This may or may not be correct considering this information was given by his son’s wife. Did his son tell his wife where his father was born? Did she remember it correctly? Did her father-in-Law tell her this? We have no way of knowing for sure. Samuel lived in Waldo County, Maine, in the 1850 and 1860 Census Records and in Somerset County, Maine in the 1870 Census with his son Albion. Looking on the map Waldo and Somerset Counties are next to each other, but Cornish is in York County which is not connected to Waldo or Somerset County, lying about 124 miles away. It’s not unusual for younger children in a family to move away from the family’s area – their birth area – in search of land and opportunity. Plus in a quick review of the early history of Cornish, the village was very close to the confluence of three important Native American trails. These trails were often the routes that future roads followed. Determining the geography of an ancestor will help us to further the research we need to do in order to chip away at CW’s Brick Wall. Hopefully while we chip away, we will also find Levi and William’s paper connection to CW’s family. Previous Previous post: Grandma(s) On Tour!